HUDDLING inside the ruin of a quarrymen’s shelter high on Kentmere Pike as mist creeps in from the north-west bringing that prickly mizzle that soaks everything – it’s not a good day. I glance at the slate slabs in the wall in a vaguely-interested sort of way and suddenly think: someone’s son built that. Someone’s father blasted the slate from the quarry; someone’s brother knocked it into manageable lumps with a tully and wedges; someone’s uncle split the lumps into slates with a riving hammer; someone’s nephew dressed them ready to be nailed on a roof; and at the end of the day, after they’d sent their produce down the fell on a packhorse, they gathered the waste and built this shelter. That would be about 150 years ago. It might have been further into the past; it might have been more recently. But they built it. And for the rest of their working lives they sat inside it to take their bait or shelter from the winter blizzards . . . They will have had a laugh while they laid their walls, and a swear, and they will have sat occasionally for a smoke and a spit and looked down on a valley that was more or less their entire world – at least the ones who hadn’t fought in the Crimea and other places. But all that’s long gone. One of the joys of writing a mountain blog is that it compels you to examine familiar places in a new light. 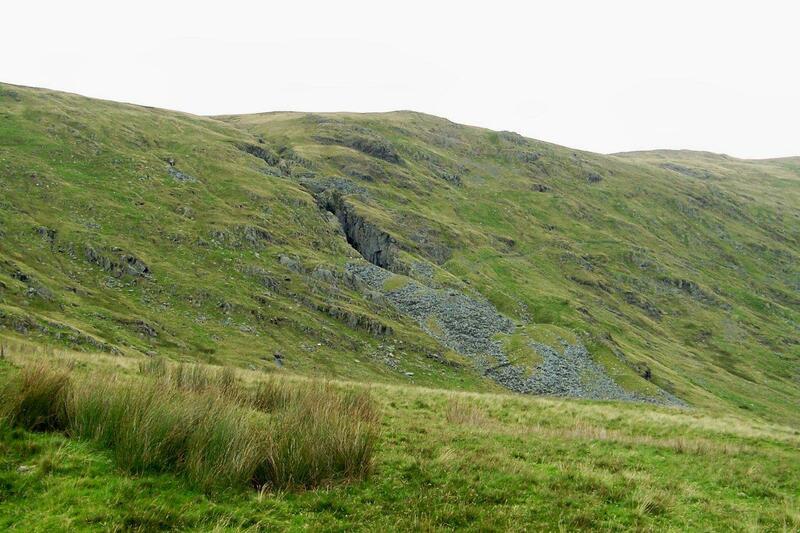 When I was striding along the High Street ridge to Ill Bell the other week, I spotted this tiny slate quarry across the valley on the west flank of Kentmere Pike, at an altitude of about 1,800ft. From a distance, it’s just a narrow slit in the fell with a fantail of quarry waste. I thought I’d take a closer look sometime. 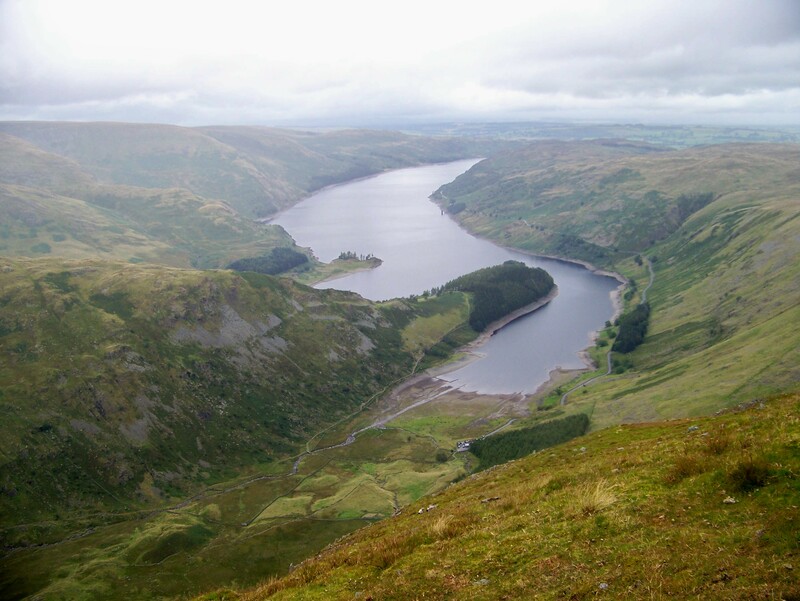 So this morning I left the car at Mardale Head, at the top end of Haweswater, and stalked up the path to Small Water and Nan Bield Pass. I followed the track down the Kentmere side a short distance and branched east just beyond Smallthwaite Knott along a barely discernable path to the quarry. And here I am. I finish my brew in the ruin, shoulder my rucksack and clatter through the mounds of slate waste into the narrow, waterlogged ginnel of a quarry that some fellas will have toiled in from childhood to the grave. I’ve been unable to find a single reference to this quarry on the internet. I don’t know anything about it in a historical context other than it was, perhaps, called Ullstone Gill Quarry and exploited the green slate veins that run in a south-west, north-east direction through Kentmere to Long Sleddale. Perhaps some dog-eared gazetteer or obscure dissertation mentions it in passing. But the font of all knowledge upon which we have come to rely – the great Google – is uncharacteristically silent. Tully – a heavy hammer, perhaps a couple of pounds in weight, with a dull axe blade one end and flat face the other. Used for knocking slate lumps, either by rough riving or docking, into manageable sizes and shapes. Bate – the cleavage plane along which slate splits, or rives, naturally. This is the all-important characteristic that separates slate from stone. 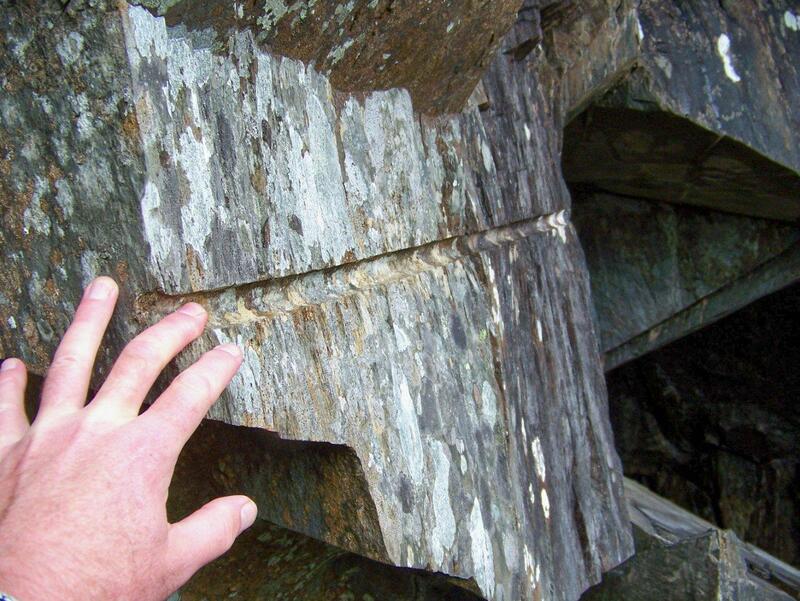 Docking – the art (and an art it indeed is) of splitting a slate lump across the bate. Riving hammer – a sharp-edged hammer used for splitting slate. These are now obsolete, having being replaced by hammer and chisel. Clog – a large lump of newly-quarried slate, or slate rock in situ in the quarry face. Mell – a large sledge-hammer, usually with a wooden head. Slug and feathers, sometimes referred to as plug and feathers – two tapered wedges (feathers) inserted into a hole between which a third wedge (slug) or chisel is hammered to split a clog. On a large clog, two or three sets of slug and feathers might be used. Jumper – a drill steel used for boring shot-holes. It was held in one hand while the end was hit with a hammer. 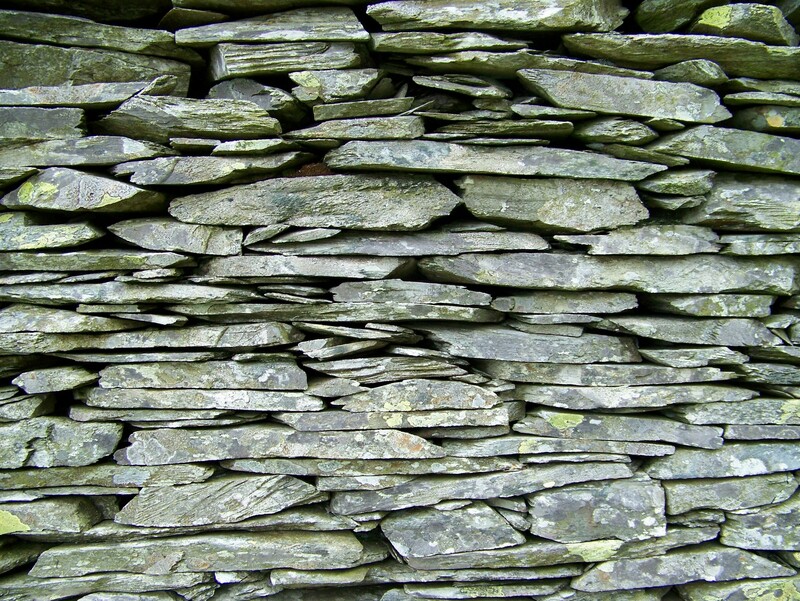 Wrinkle – an irregularity in slate that deflects the bate, causing a wrinkled effect. Slype – a vertical joint or fault in a quarry face, filled with crumbly rock, or possibly an empty void. This one’s interesting because a slype is also a narrow passage in a cathedral or church that joins the transept to a chapter house. Probably a common root there. Ginnel – a Northern dialect term that means narrow passageway; but in quarrying parlance it’s a cleft driven into a quarry face to develop the working. 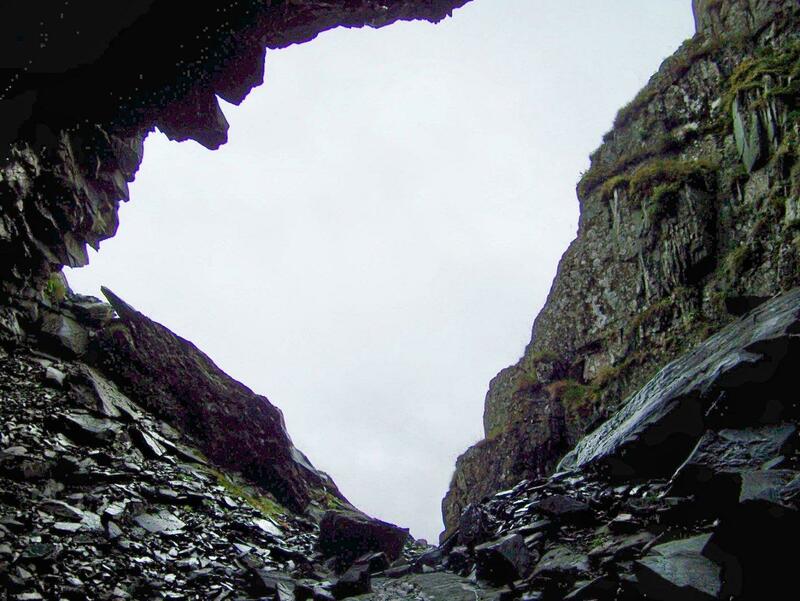 Bate-hole – a shot-hole bored along the cleavage plane; the favoured method of quarrying the blue-grey Silurian slates of the south Lakes and Furness peninsula. 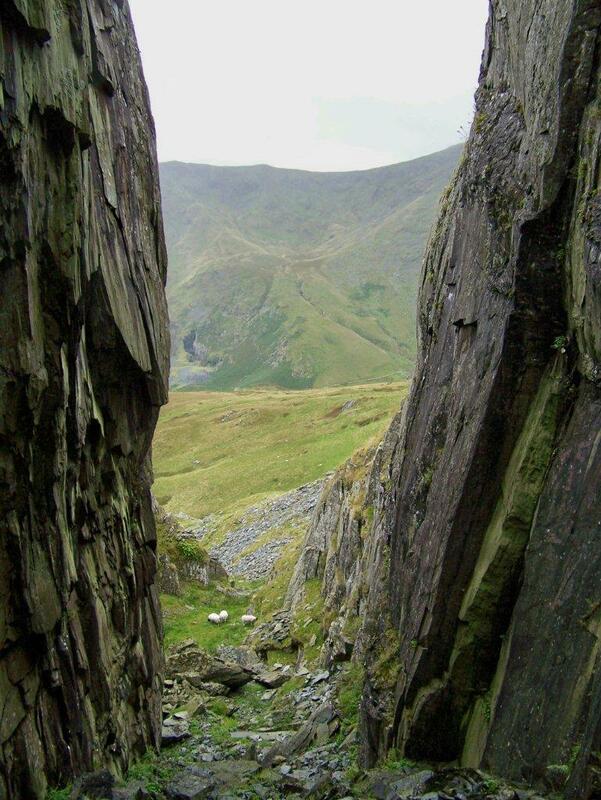 Cross-hole – a shot-hole bored across the bate; the favoured method of quarrying the green and silver-grey Ordovician slates of the central Lakes. Closehead – an underground quarry or slate mine. I shelter from the rain in the lowest working, which is a narrow though deep and impressive slit. The outlines of cross-holes are in evidence on the quarry faces – hand-bored by chaps whose names have been forgotten. And that’s bloody sad. It’s almost a crime. A waterfall plunges down the innermost face. This must have been a cold, damp place in winter – no sun until late afternoon and water spray continuously in the air. Inside the upper of the two workings are the beginnings of what might have become an impressive closehead. But it was not to be. This is where fortune ceased to smile – if it ever smiled at all – and the venture collapsed. At some date, which is also forgotten, the quarry fellas picked up their tools and drifted elsewhere. 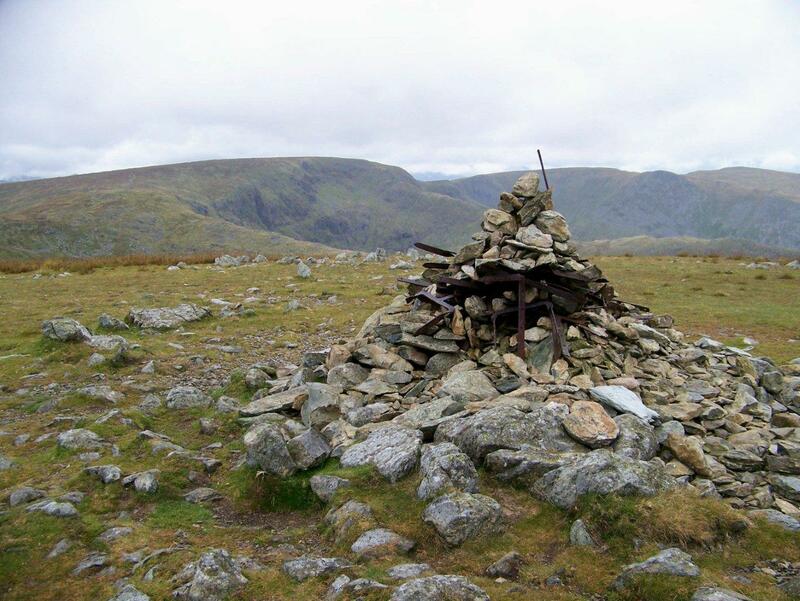 And me, I continue to the crown of the ridge and the summit of Kentmere Pike. 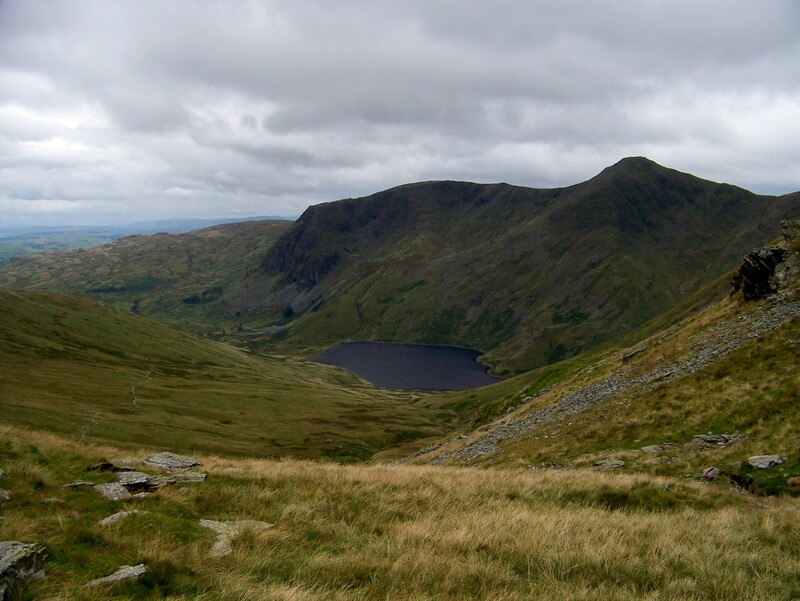 I then double back and drift along the ridge to Harter Fell, where there are fine views over Haweswater, and drop onto Gatescarth Pass and the path down to Mardale. These mountains never cease to deliver something new, an intriguing snippet of history that opens a window onto how our forefathers lived and worked. 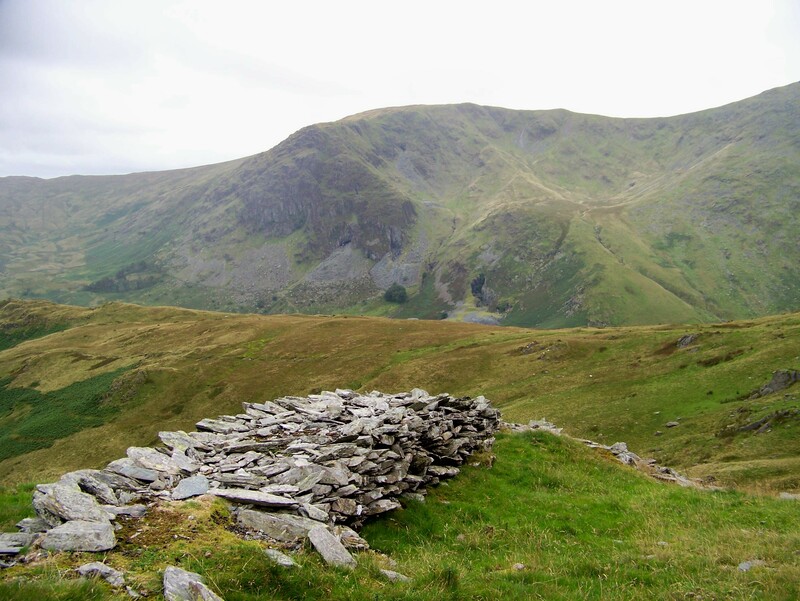 Every valley in the Lake District is pockmarked with mineral ventures of one kind or another. On every hillside someone’s father and someone’s son have scraped back the turf with picks and corracks (corrack – there’s one I’ve missed) to break the rock in search of copper, lead, iron and slate. Sometimes they were lucky – but most times they weren’t. Corrack – a corruption of coal-rake. A short-handled hoe or mattock, handy for clearing up rubbish at the end of the day and leaving a job half tidy. Like now. 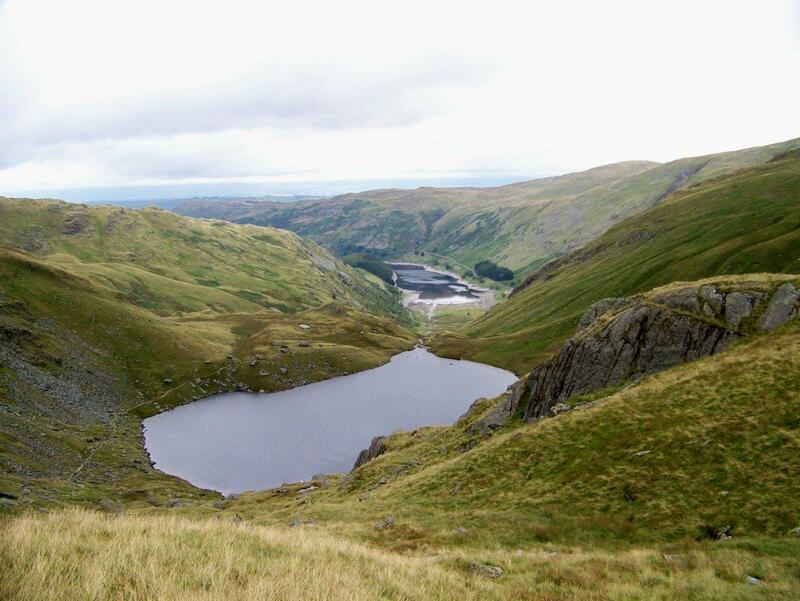 This entry was posted in Climbing, Environment, Geology, Hiking, History, Industrial archaeology, Life, Mountains, Quarrying, Slate quarries, Walking and tagged Lake District, Mining History, The Lakes. Bookmark the permalink. Cheers. Have a great day tomorrow, Dohn. I’ve been looking at your blog and there’s some interesting stuff. This post came across as making you quite sad. We’ve never really had as much mining, or other industry for that matter, in the countryside where we walk. It’s always been the remains of “hunting lodges” that probably don’t deserve the same sympathetic nostalgia. We do of course have the remains of whole comunities that were “cleared” for sheep and they do provoke feelings of injustice. The problem comes though when you start wondering about how it could possibly have survived as it was, be it slate mining or crofting, so at some point it had to end. It could never be described as an easy, or even comfortable, life – honest and simpler perhaps but would we really want to see that type of life still going on? I think we could swap philosphy on this subject for a while! Anyway I expect your next post to be more upbeat!! I think what I find sad about stuff like this is not that a way of life and traditions have vanished – which is indeed a shame despite the hardships people endured in past times – but that very little of it is recorded. The records that have survived from these industries relate mostly to the companies that ran them. What does not exist is any reference to the poor chaps who worked their lives away for a few shillings to feed their familes and in doing so left their mark on the landscape. Like the Clearances, we know roughly how many families were disposessed and from where – but they are just numbers. They were peope who worked and suffered, they had lives and hopes and dreams just like us – but we don’t even know their names. Anyway, I’m off on me hols for a couple of weeks. Cheers John. What a fantastic insight , I loved your film especially the triangular bore hole towards the end & how it got its shape ,purely all by hand, facinating stuff & a fantastic read as always. Thanks Paul. I don’t know what it is about holes in the ground, but I’ve always been fascinated by them. And the Lake District is full of them! Kentmere and Long Sleddale are places I don’t know all that well, so each visit is a bit of an adventure. That’s what’s great about the Lakes. The place is soooo interesting. Bursting into the sunshine of the twenty first century, eh? Video star! I really enjoyed that – I had no idea how slate was mined / quarried. It is quietening to think of all those men hammering away all their lives to produce that green slate that is so prevalent in the Lakes. Next time I am up there I shall be poking around all the workings looking for the triangular chiselled holes. Fascinating stuff. Video star indeed. You know when you’re a star when you’re rubbing shoulders with the likes of Bergerac and Charlie Hungerford on sun-kissed holiday islands! They were tough people in those days, as hard as the rock they quarried. When I was 18 or so I got a temporary 2 week job working in a local quarry (Dunhouse which quarried sandstone) drilling shot holes, chipping out dog holes and spliting and shifting ruddy great blocks. Apart from the fun of blowing things up it was hard work and bloody dangerous at times. So much so that after I left one of the lads fell down the quarry face while still inside a skip (we used to drill half way up the face in it). Instead of using a hook to lift it they used the dog chains which slipped apart. It must have been a lot worse 150 years ago though and I bet many a stone house or wall was built at the cost of the life of some poor quarry worker. You are right there must be many a story now lost forever of the daily lives of ordinary folk simply trying to put food on the table. I found the vid interesting, btw are we going to see more in future posts? Hi David. That’s interesting about Dunhouse Quarry. I’ve never been in there but I’ve cycled past it a few times. Yes. it’s hard and dangerous work. I don’t know about more videos. They always seem like a good idea at the time but when I look back at them my toes curl up with embarrassment. You’d like to think that they left the harsh conditions and hard labour for cushier conditions and easier work elsewhere. Probably not though, you can imagine them ending up working in a cotton mill and living in the slums of a mill town. Forever looking back to the clean air and wind of the fells. Enjoy your hols by the way. After a week of being back my hols became a distant memory. Hi Greg. Thank you very much – I’ve just got back. They are already a distant memory, but I’ve got loads of pictures and some of them look half decent. Very hot, very sunny, very cheap and lots of mountains. Now I’ve got to start writing it all up. Hi, I enjoyed your video very much and learnt a lot. I passed by that quarry on my bike a while back but it was in low cloud at the time so I didn`t get to see much. I hope don`t mind but I shared your video on facebook in the mines and quarries of the lake district and Cumbria group. Hi Steve. Glad you found it interesting. It’s an interesting area and one that’s overlooked by most walkers. Just Found this via Facebook, (Cumbria Mines and Quarries) What a gem. Your Knowledge of geology, history, and above all the methods of working Slate are superb. What I think impressed me most however was your obvious feelings for such places and the lives and toils of the “Auld men” who worked these places. I served my time as a River at Elterwater and yes, escaped many years ago to warmer, easier work even in modern times. 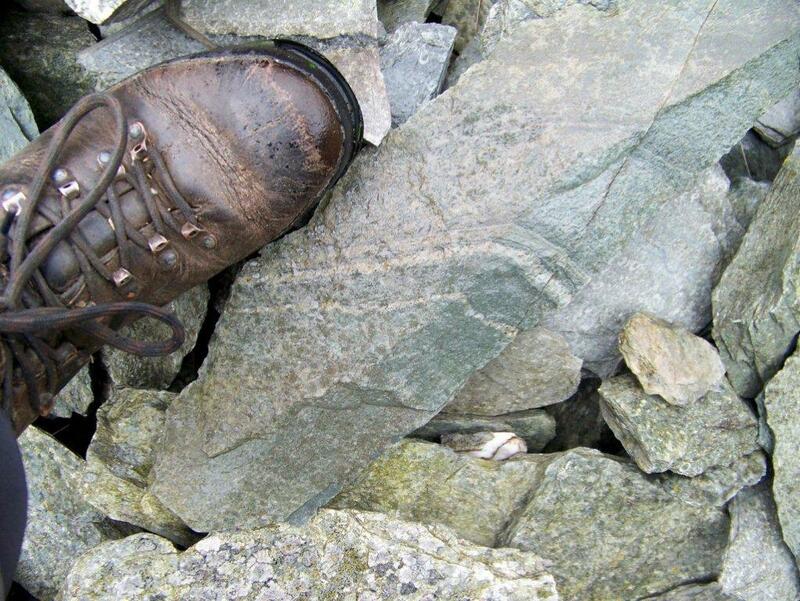 However the Slate never leaves you and I share your thoughts and feelings on the relics of this industry, and in particular those hard won, hard places on the High fells all but forgotten by a few who understand their significance and can only admire those who came before and toiled therein. Good to hear from you. I think you’re the first timed-served quarryman to comment here, so that’s pleased me no end. I worked for Burlington at Kirkby during the 1980s as a level-driver. During quiet times when there was no tunnelling to be done, I worked with the quarrymen winning slate and knocking up clogs. I learnt a great deal from them and made notes of everything, which is just as well otherwise I would have forgotten a great deal. I have spent many hours poking around old quarries. Every one of them has a different history – and nearly all of that history has been lost. I find that very sad. I was at Elterwater 1981-’86. My father was a Rockhand in various Greenslate quarries, and I had forelders who worked Coniston and Troutbeck Quarries. So to find such a comprehensive and thoughtful piece by a man who knows what he is talking about was wonderful. While I was at Kirkby they transferred a lot of the green slate men down there from Broughton Moor and the Coniston area. I used to know a lot of them. I finished at Kirkby in 1988. Before that I worked as a rock-driller for Tilcon at Stainton Quarry, near Barrow, and before that for Cumbria Stone Quarries at Crosby Ravensworth,near Appleby, sawing and polishing stone. 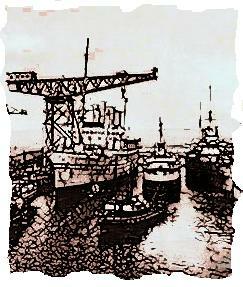 I feel quite nostalgic about it now, though at the time it was cold, wet, dirty, and the wages were low. I suppose you can’t have everything. I left January 1986, I think the Green slate men were moved down to Kirkby just after thet, they were planning it just before I left. You may have met a few guys I worked with including Cliff Barrow? he last hand dresser, my uncle. The wages weren’t too bad once time served. Burlington used to put a couple of quid a day away whilst you were serving your time, available on completion. I used mine to go to Australia! I almost feel as though I was one of a last generation now, guess there is only Honister left to carry on the tradition. I’d like to go back some time and have a look round. I bet I wouldn’t recognise the place these days. It’s strange to think many of those old skills such as hand-dressing have disappeared. All my diaries from that period are in storage at the moment because we are moving house. I’ll have a read through them when I get chance and see if I can come up with some names. That would be interesting, to be observant and document what you saw is marvellous. At an altitude of 1750ft on the slopes of Brown Howe, it is reputed to be the oldest quarry in the valley. In 1829 it was owned by Edward Thompson & Sons and produced silver-grey slate that had to be sledged down the steep valley side. Almost at the top of the spoil is a collapsed cutting, and at the top of the sledging track are ruined huts. The main quarry is narrow and has been cut back into the fell with sides up to 100ft high. At the back is a waterfall, eminating from the beck which at one time would have been diverted away from the workings. Rob, thanks for that. It is an almost perfect description of the quarry, right down to the waterfall. Hart Crag – I shall remember that! Very interesting bit of film and more important accurate, something which cannot be said of a lot of utter rubbish some ill informed people put on the internet for yet more gullible people to believe as true. Following the slate further takes you to from Steelrigg to Troutbeck Park High Quarry which is probably (Ian Tyler) one of the oldest in Cumbria and could be the first place to work with closeheads i.e. following the vein of slate down the hill and driving levels in to intersect the good metal. 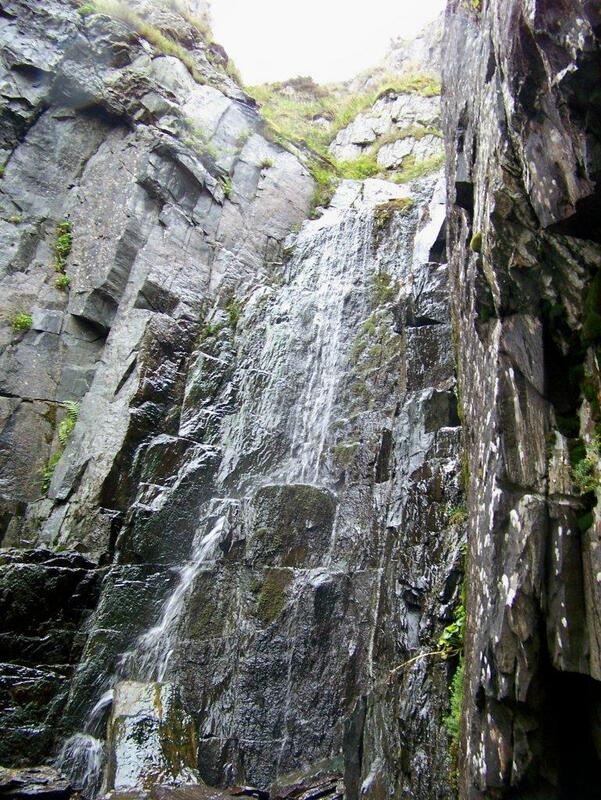 This work at Troutbeck Park was done in around 1753/5 by Henry Turner and Nicholas Cowperthwaite who were described as Slategetters and employed in driving levels at the quarry. Henry Turner was the father of William Turner who became, with Thomas Casson, one of the main quarry owners in North Wales from 1800 when they first acquired the Diffwys Quarry above Blanau Ffestiniog. Who knows what happened to the small weighbridge at Applethwaite Quarry since they put up the mobile phone masts? Hi Geoff. Thanks for your comment. 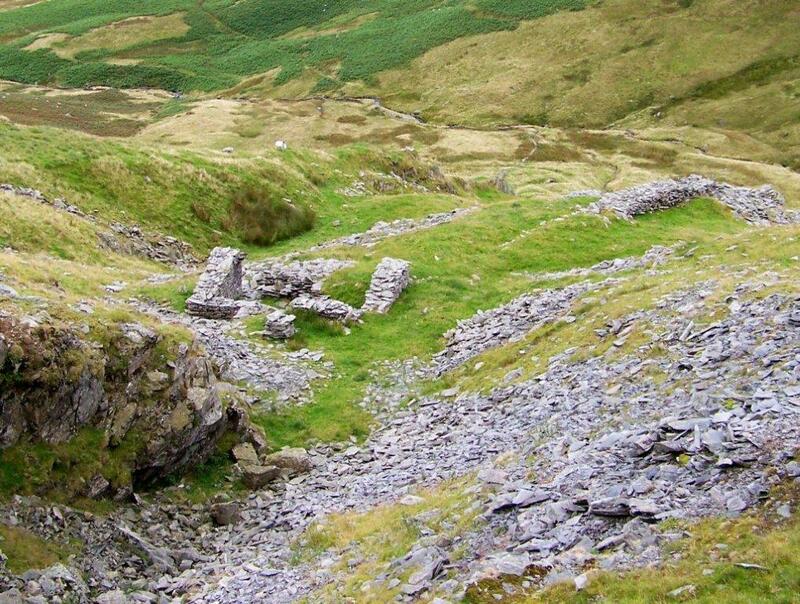 Troutbeck High Quarry is one of the few I’ve never visited. Must put it on my list for future excursions. I was interested in what you had to say about Turner and Casson. I was aware of the Welsh link but I hadn’t realised they were big quarry owners in Cumbria, too, although I knew they had some involvement with the Walna Scar Quarries above the Duddon Valley. I should do some research into this because my cousins are called Casson and they originate in Ulpha, so there might well be a family connection. Henry Turner moved from High Park to what was Walney(Walna) Scar Quarry and it was his son William who with Thos.Casson went to Wales . There were another two Cassons, William and Thomas working Commonwood at the time . Yet another William Casson, not related worked Commonwood in about 1910-20 and his grandson still lives in the valley. I wrote a small book on the valley and as much as I could discover about the quarries and mines etc is covered in it. A Thomas Williams came from Rhostryfan in North Wales to work Commonwood with his two nephews and he married a local girl. He was drowned in the working in 1880 and his wife re married to William Casson who eventually took over the quarry having been manager for Alan Rowbotham. He was from the Wirral and had taken over some time after Williams drowning. It is interesting that John John Thomas who was Thomas Williams nephew and came with him from Wales finished up owning the Tilberthwaite Green Slate Company with Hodge close, Parrock, Moss Rigg , Steelrigg and Jumb quarries in his ownership. So that took the story full circle from Henry turner at Kentmere on to Dunnerdale his son William to Wales back to Dunnerdale with Thos, Williams and then to Kentmere with JJT . He also became Mayor of Kendal from 1916 -18 and a freeman of the town – not bad for a chap who could not speak English when he first came to the Duddon Valley. Mo Holland tells me to send her best regards to you. Blimey. You’ve covered some ground there, Geoff. It’s a fascinating subject and one I never tire of. If the grandson you talked to, the grandson of William Casson who worked Commonwood, is Eddie Casson from Whistling Green, then his younger brother (Bernard) is married to my mother’s sister. It must be 25 years since I’ve been up that way and poked about in Commonwood and Walna Scar, and I never did know much about their history, so it’s good to learn a bit about what went on in the old days. Say hi to Maureen. Hope she’s well. It’s been a long time. I have video of the dig which is good to look back on and I’m showing it to the Duddon Valley History group but that’s not ’til July next year. Email me at my email when/if you would like to go round I’d be pleased to meet you having got a copy of your account of the Wythburn mine. The incline has suffered badly from the 2015 storms.